NCIA Executive Director Judi M. gaiashkibos and her daughter Katie Brossy, an attorney at Akin Gump DC office serving as the pro bono legal consultant on the bill, met with Nebraska Senator Mike Johanns to discuss legislation to designate the Chief Standing Bear Trail as a National Historic Trail. Both gaiashkibos and Brossy are enrolled members of the Ponca Tribe of Nebraska. Legislation has been introduced in the House of Representatives by Nebraska Congressman Jeff Fortenberry and in the Senate by Senator Johanns to task the National Park Service with conducting a trail feasibility study. The votes for this legislation will take place later this year or possibly early next year and is a necessary first step in gaining National Historic Trail recognition. 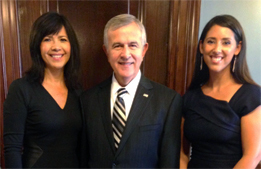 Pictured are : Judi M. gaiashkibos (left) Senator Mike Johanns (center) Katie Brossy (right).